I'm not going to review this one. Nope. Uh-uh. Pretty much everyone and their mother has already reviewed it, so I'm going to point you to their reviews and just tell you that I LOVED IT. It's sad and violent and lyrical and hopeful... Truly, I think it's the best book I've read in a long time. If it's on your TBR list, bump it up. 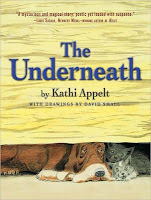 The Underneath is also in the running for the ACPL Mock Newbery (so if you've read it, feel free to add your comments). Just wanted to let you know that both Mary Lee and Franki at A Year of Reading reviewed it yesterday, also. Can't believe I haven't read something that people love so much!! Thanks for your recommendation! I know what you mean about not feeling like reviewing something because what can you add the conversation besides your vote of "yep! I loved it too!" I'm torn on this title though. EVERYONE I know who has read it loves it, but I have no desire to pick it up. I so doesn't look like my cup of tea. Ah well. 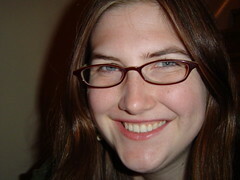 Karen - Thanks for catching my mistake! I've updated the links. Besides the fact that it's hard to say anything new about THE UNDERNEATH, it's hard to write about it without babbling or giving everything away! A myth for all ages - reminding us of our humanity - our fears, our frailties, our helplessness. A glimpse of the story that we live and the way we hope. Real mistakes that can't be fixed, real blood, flowing sorrow...it all goes on and Appelt captures it in a flawed but powerful narrative.